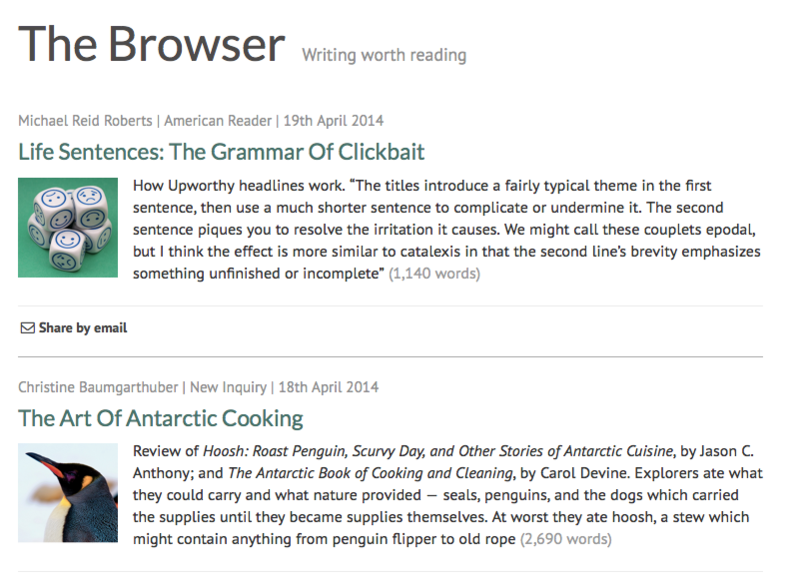 Links to the best recent writing for the intelligent general reader. The most influential small website on the internet. 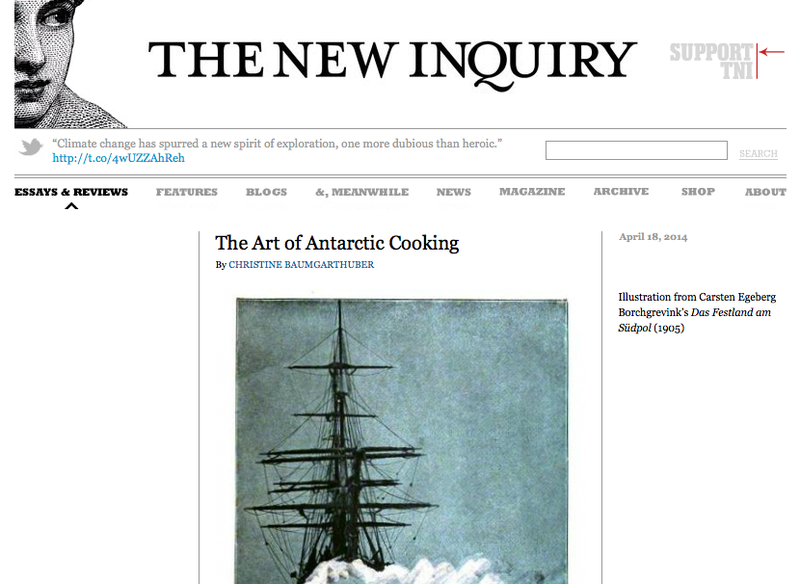 A wonderful article The Art of Antarctic Cooking by Christine Baumgarthuber is in The New Inquiry featuring The Antarctic Book of Cooking and Cleaning reviewed with Jason Anthony’s Hoosh. Thank you Adrian Chen for finding us before the book was out! One constant among the variables was Wendy Trusler, whom Devine hired to be the expedition’s cook. As ingenious and stalwart as her Antarctic forebears, Trusler recounts the joys and hardships of kitchen management at the end of the earth. Trusler’s recipes are a charming mix of her own idiosyncratic concoctions and recipes cherished and shared by her fellow activists. There’s “Maxim’s Moonshine,” a potent liquor of yeast, sugar, and water. Trusler got the recipe from a Russian glaciologist who warned that “it is … absolutely disgusting stuff, which may be consumed at an Antarctic station when nothing else is available.” Maxim also supplied an equally dubious recipe for a mixture of kelp, onion, garlic, and mayonnaise he called sea cabbage salad. Trusler juxtaposes these concoctions with more appetizing offerings such as mulled wine, rosemary maple borscht, rosemary-encrusted lamb ribs, custard with fruit compote, cranberry fool, and cheese fondue. 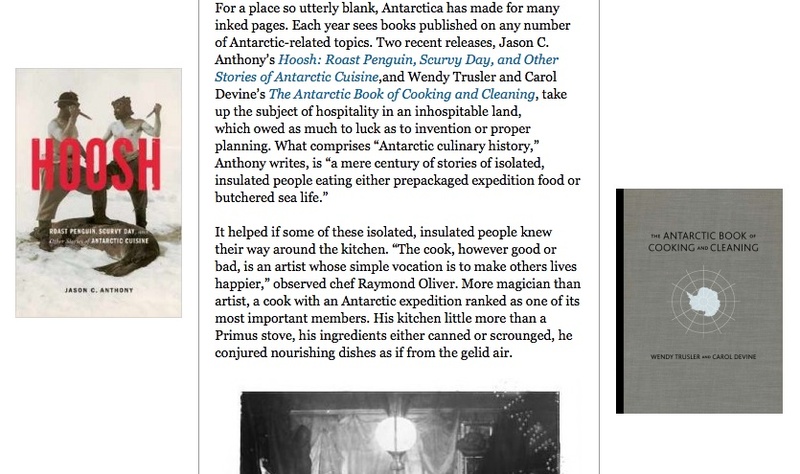 (This last dish moved one volunteer to opine, “If Wendy had been along, Scott would have made it.”) Containing some the most tempting expedition cuisine I’ve seen, The Antarctic Book of Cooking and Cleaning is a must-buy for eco-conscious foodies. Both Anthony’s Hoosh and Devine and Trusler’s The Antarctic Book of Cooking and Cleaning illustrate the extent to which food nourishes the spirit as well as the body… The Antarctic Book of Cooking and Cleaning is an enjoyable glimpse into a noble endeavor undertaken in the closing years of the last century, when there still were places that seemed cut off from the rest of the world. About the writer: Christine Baumgarthuber holds a doctorate in English Literature from Brown University and writes The Austerity Kitchen—where the alimentary is elementary. Her work has been featured by Dissent, Lapham’s Quarterly Roundtable, MAX JOSEPH and Bon Appétit, and she has appeared on Heritage Radio Network’s A Taste of the Past.